Christmas is a season of gifts. A lot of gifts are being exchanged during the Christmas season. What should be the reason why Christmas turned out to be a season of gifts? This may not be so much because the three wise kings brought gifts to baby Jesus on the first Christmas night. Rather, this is because Christmas itself is the greatest gift ever exchanged in human history. Christmas is God gifting His only Son to the world. Jesus Himself is the gift. There has never been nor will there ever be a greater exchange of gift or a greater gift in human history. 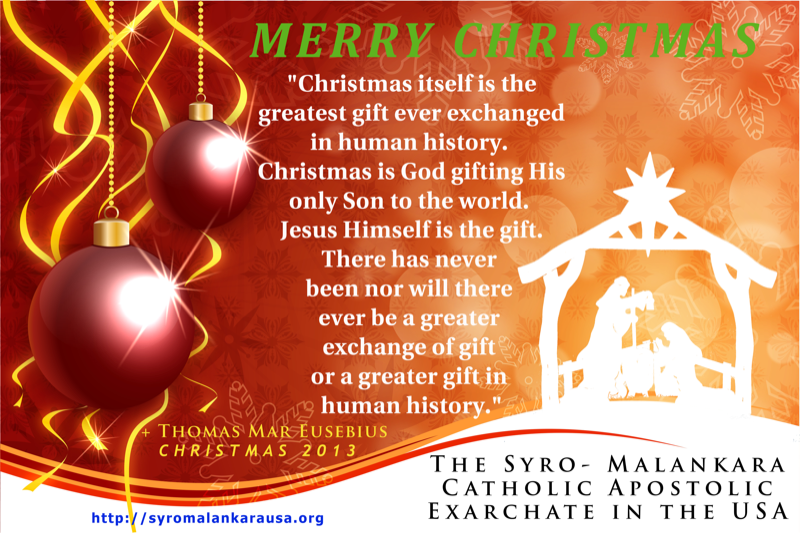 And what is the reason for this marvelous exchange of gift by God? The answer to this question would justify every genuine exchange of gifts also by human beings; namely, why someone should give a gift. According to the Bible, there is only one reason for this act of God and that is love. Love is the reason for giving. We read in the Gospel according to St. John; “For God so loved the world that He gave His only Son ….”(Jn. 3:16). True gifts are prompted by genuine love. It is my love for the other person that makes me make a gift to that person. This would bring home to us some pertinent messages. Firstly, just as Christmas signifies the gift that is Jesus, i.e., Jesus becoming a gift for all of us, Christmas invites each one of us to be gifts ourselves. Our lives have to be gifts to the people around us, in our families, in our parish communities, in our societies. How could we make a gift out of our life? The only way this is possible is through love and through acts of love. When our words emerge from love, our very conversation becomes a gift to those who listen to us. When our acts are charged with love, they turn out to be gifts to those with whom we associate. When our hearts are filled with love, our very presence becomes a gift to the others. Those who genuinely love, cannot but offer their lives as a gift to those whom they love. Consequently, the husband has to be a gift to the wife in the family and vice versa. Not only that the children are gifts to the parents, but the parents have to be gifts to the children as well. During this Christmas season, as we give and receive gifts, Jesus invites us to be gifts ourselves. Secondly, besides making myself a gift to the others, I need to accept the others as God’s precious gifts to me. Every person that I come across today, every experience that I go through today, is God’s precious gifts to me. I must learn to accept and receive them with the joy and gratitude with which Mother Mary received baby Jesus into her arms on the first Christmas night. Every person in my family is God’s special gift to me, no matter how limited they are, how unacceptable they may appear to be. I need to accept them unconditionally as God’s precious and personal gifts to me. All my experiences, however painful they are, are to be considered as God’s very special gifts to me. The peak of Christian spirituality is the willingness to accept even suffering as God’s special gift to me, joyfully, thankfully, without grudging, without complaining. It is easy to accept blessings as a gift from God. But it requires exceptional faith to accept every suffering as a blessing. Again we have to learn from the life of Mother Mary. She is the best example of a faith that enables us to receive all the sufferings of life as God’s gift. She must have received the lifeless body of her Son Jesus into her arms from the cross with the same faith and trust with which she received baby Jesus on the first Christmas night. Christmas was not just an event or a season in her life, rather she made her whole life a Christmas season. Christmas invites each one of us to make a beautiful gift out of our life, by being a gift and by accepting everyone and everything as a gift. I wish all of you a Blessed and Joyous Christmas!